Chemical and Biochemical Approaches for the Study of Anesthetic Function, Part B, Volume 603, presents a coherent description of the campaign towards understanding anesthesia. 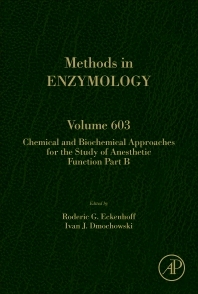 It includes a variety of highly debated topics, including sections on computational approaches, best practices for simulating ligand-gated ion channels interacting with general anesthetics, computational approaches for studying voltage-gated ion channels modulation by general anesthetics, anesthetic parameterization, the kinetic modeling of electrophysiology data, evolving biophysical technologies, fluorescent anesthetics, lipids, membranes and pressure reversal, in vivo technologies, and more. Originally aspiring to be a marine biologist while at the University of Miami, Rod elected instead to join the ranks in hyperbaric medicine after graduating from Northwestern University Medical School. Since the only formal training program existed in the military, he became a US Naval officer, ultimately spending most of his time performing hyperbaric medicine research at the Naval Submarine Medical Research Laboratory in Groton, CT. Aiming to continue in this area, but in a more academic setting, he returned to civilian life as an anesthesia resident at the University of Pennsylvania, in large part because of the renowned Institute for Environmental Medicine at Penn. But the ability to more definitively answer questions persuaded Dr. Eckenhoff to pursue basic science training in the Andrew Somlyo lab at Penn., where he accidently discovered an approach to measure subcellular concentrations of anesthetics. This launched him in an entirely new direction, ultimately discovering anesthetic photolabeling, and adapting a series of traditionally biophysical approaches to the study of anesthetic mechanisms. Receiving his first NIH grant in 1991, Dr. Eckenhoff assembled an interdisciplinary group to study anesthetic mechanisms, and just a few years later, led a program project grant to funding on the first attempt. This grant is now in its 18th year and has evolved to now include seven different institutions across the country. The study of anesthetic mechanisms opened new doors into adverse effects, such as possible interactions with Alzheimer neuropathology, an issue that has gained considerable traction over the past decade. Finally, Dr. Eckenhoff has had the privilege of mentoring dozens of outstanding physicians, physician/scientists and basic scientists over the last thirty years. Ivan grew up on Cape Cod, MA near the scientific institutions of Woods Hole. This cultivated a strong interest in Nature, offering exciting summer employment and spirited science fair competitions. Ivan was named a Presidential Scholar in 1990, and went on to attend Harvard College and major in Chemistry. Ivan was inspired by research mentors across many areas of Chemistry and Biology, including George Whitesides (Harvard), Helmut Ringsdorf (JGU, Mainz, Germany), Harry Gray, Jay Winkler, Scott Fraser, and Eric Davidson (Caltech), en route to becoming a professor of Chemistry at the University of Pennsylvania (Penn) in 2003. Soon after joining the Penn faculty, Ivan received a phone call from Rod Eckenhoff, who described fascinating, still-unresolved molecular questions surrounding general anesthesia. A long-standing collaboration was born, which has led to several joint publications probing anesthetic mechanisms. One highlight was the co-discovery and application of the first fluorescent general anesthetic. Ivan’s research program has centered more broadly on developing molecular probes and spectroscopic tools to enable the study of proteins and nucleic acids for biomedical applications. Of particular interest is the noble gas and general anesthetic xenon, which has led to the development of biophysical approaches to elucidate xenon interactions with small-molecule and protein hosts. Ivan’s laboratory has also developed strategies for photomodulating nucleic acid structure and function, with emerging tools for modulating gene expression and harvesting mRNA from single cells in living brain tissue. This work has been generously supported by the NIH, NSF, and DoD.